A list of 65 words by plethora. This is my list right? But I never actually added anything to it. I guess something must have distracted me. On the place where I get my email (I KNOW it has a name, I just don't know what it is..) There are these ads that show up on the right-hand side (wordie has them). Anyway, one just came up on mine and it was an illustration of a person who only could be identified as John Lennon (circa Yellow Submarine days) holding a giant submarine (!) sandwich that clearly had meat in it. It was an ad for Wawa (they're one of those places that has a gas station and a mini-mart inside...mmmmm). They are having some kind of submarine sandwich sale or something. Here's my question: Wasn't John Lennon a vegetarian? I'm confident that at least one wordie will know the answer! P.S. Sakhalinskii, I don't get it. That French film, except this time starring William Shatner. Skip: Of all people, you certainly don't need to burnish your '60s creds. I've seen you come up with some of the most arcane 1960s lyrics ever! Skip - soooo cool! I love, love, love those jeans, man! You are a very good artist. Can you wash them??? what's this now? mandatory psychosis? "all persons found to not be tripping balls will be denied admittance to this picnic and forcibly removed/fed the succostash as necessary." 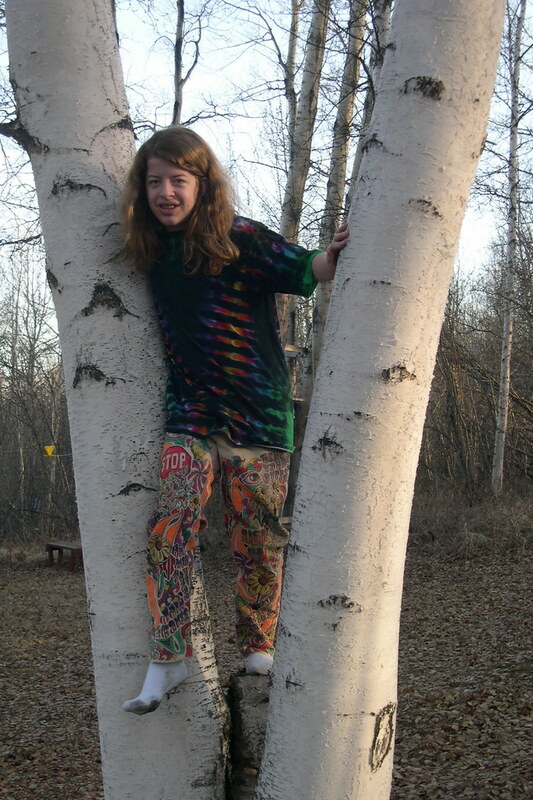 Speaking of 60s clothes--Here's a picture of my son taken several years ago in a pair of white levis that I painted when I was in high school in '68. We called them "psychedelevis." Really, rt? That makes me feel a little weird... Here I was thinking paisley was normal. Pleth, it's clear you haven't met The Dictators. The only people who dress like that in my company are the IT people. Pleth - I love you! You are my second daughter! Isn't it a little redundant to require everyone to wear 60s clothes, rt? Doesn't everyone dress like that all the time anyway? I mean, surely I can't be the only one. You do good work dc - the entire Wordie nation thanks you! Don't worry pal, I mean, sir, they'll all be here! I'll be bringing all the troops dc. Will you have enough for a reinforced battalion of wordies and an amphibious brigade? If not, well, I won't be responsible for the consequences. They hate being disappointed. You are forbidden to not to get back to me. Well, since it's a mandatory picnic, I think we should have all of them. ALL. And everyone should be required to wear 60s clothing. Or else. Let me check with the dictators and I'll get back to you. OK. Here's what I'm thinking: It's a 'picnic' (of sorts) right? Sooo, we're going to do the traditional picnic-food thing. Think "retro"
All food will be priced by the ounce and will arrive wrapped in foil or in resealable baggies to preserve freshness! Now where are those brownies? Whatever dc serves is fine - I've really got the munchies. Could I order a jar of peanut butter & a spoon? What?? Sorry dc, man, I just totally spaced. Great! I'm thinking this group is going to need a LOT of greens to mellow them out. Let me work up a menu. Anybody said apron? Here I am. Er.. yes, Mia. Sugar, that's it. Quite an assorted crowd of slightly dotty and forgetful people has gathered here. Are you all high on sugar..? May I join? Where's my psychelatessen*? Who is that over there in the corner? They are totally bogarting that spleef...oh, it's okay, it's me. Yes! It's...um...the, um...--wait, what did you say? Oh man--I've got a serious case of the munchies. Know a good delicatessen? Oh wow. I'm going to...what were we talking about? Let's do it right after the be-in in the park. Bring your incense and finger cymbals. Yea! I love it when other people do my work for me!! Thanks, pleth!